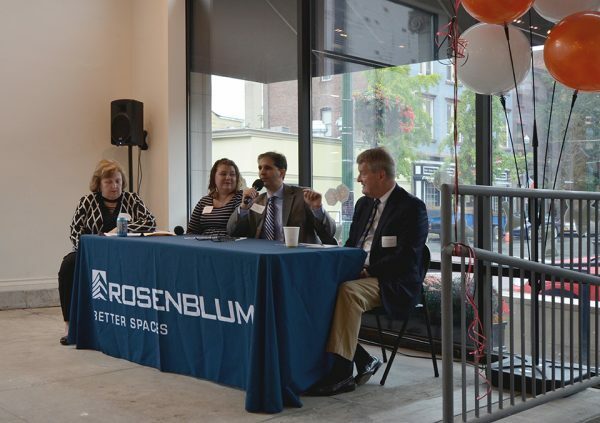 Current and former journalists from The Record gathered for the morning panel on Friday, September 28, to share insider views of working at The Troy Record building and the current state of journalism on the local and national levels. Record alumni Eric Anderson (now Business Editor at the Albany Times Union) and Mike DeMasi (now a reporter at the Albany Business Review) were joined by current Record reporter Lauren Halligan for the discussion. Former Record editor Lisa Lewis (now Senior Editor at the Times Union) acted as moderator, and former Record Editor Rex Smith (now Editor of the Times Union) delivered welcoming remarks. Panel from left to right: Lisa Lewis (Moderator), Lauren Halligan, Mike DeMasi, and Eric Anderson. “The Newsroom: Community Cornerstone” provided a rare look into the unique experiences and perspectives of experienced journalists in our region, on topics as varied as the current state of newsgathering, changing public opinions about the press, and personal stories from the newsroom. The event was held at Bard & Baker, which is set to celebrate it’s grand opening on October 11th. 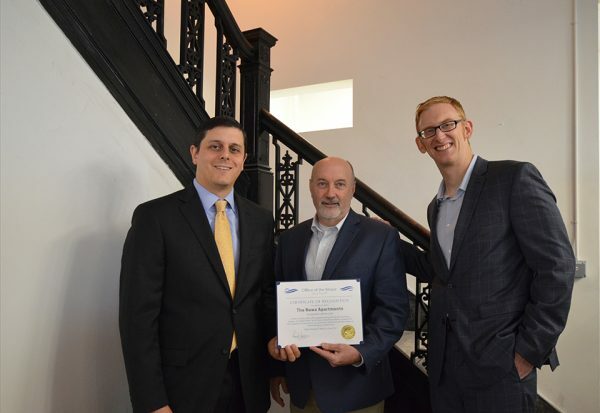 Rosenblum CEO Seth Rosenblum (left) and Executive Vice President, Jeff Mirel (right), with Troy Mayor Patrick Madden. The News Apartments combines a historically sensitive adaptive renovation of the century-old Troy Record building with a complementary new addition, providing 101 market rate apartments, amenity space; e.g. fitness, pet care, coworking, bicycle storage, onsite parking, and ground floor commercial space. Preleasing began earlier this year and as of the event, all 101 apartments had been rented. 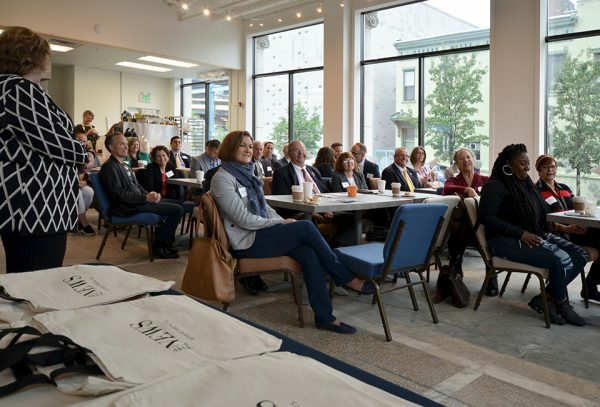 “The Newsroom: Community Cornerstone” was hosted at Bard & Baker: Board Game Cafe, one of the new retail business located in The News. During the completion celebration, The Rosenblum Companies also presented Lisa Lewis with a donation for Clothe-A-Child, a non-profit that provides new clothing to youth ages 4 to 12 who would otherwise go without. Clothe-A-Child was founded in the mid-1970s by the Horvitz newspapers, a former owner of The Record. Although the Horvitz newspaper chain no longer exists, the program has continued at The Record for 44 years and served an estimated 25,000 local children. Today, The Record covers administrative costs and donates advertising while Ms. Lewis manages the campaigns on a volunteer basis. The initial donation by The Rosenblum Companies in the amount of $1,906 was a reference to the year the original Troy Record building was built. Subsequent additions were constructed in 1924, 1935, 1947, 1967, and circa 1980. Rosenblum will promote the Clothe-A-Child winter drive to residents of The News and match their donations dollar-for-dollar.